How often have you heard someone trot out the line “I fancy Chelsea/Arsenal/Tottenham today because they’re at home” or “They’ll struggle to get anything at St James’ Park/Bramall Lane/Fratton Park”? Whether it’s from friends, pundits or that guy who sits by himself at the end of the bar in your local and likes to let you know how much he knows about football, we hear variations on this all the time. Understandably so too, because from all of our experiences watching football we know it to be true. Home advantage is real. But why? What is it that makes playing at home an advantage? Is it familiarity of the pitch and surroundings that’s most important?Or not having to travel a long distance to the ground? Perhaps sleeping in your own bed the night before rather than a hotel? Or is having the majority of the support in the ground the most important thing? And if so, by extension, do bigger, more vociferous crowds give a slightly bigger advantage? Perhaps it’s match officials who may, consciously or subconsciously, award a few more of the 50-50 decisions to the home side. However you choose to rank the importance of all of the possible factors, we know home advantage exists. But to what extent and how does it vary by division? 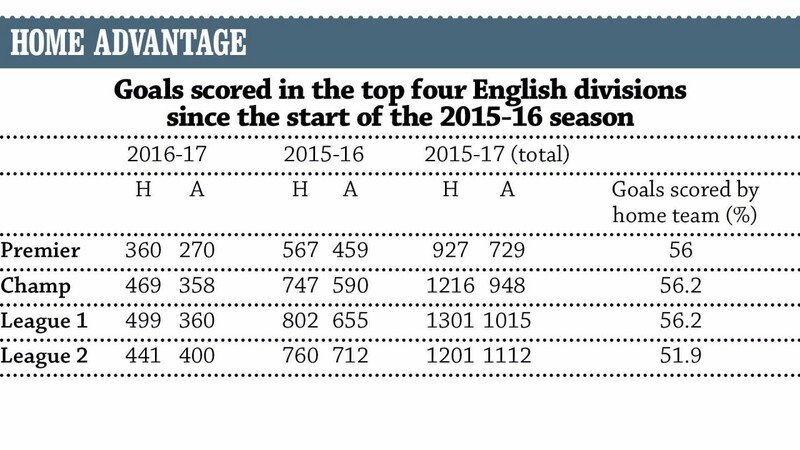 The table looks at the past 18 months or so in English football and charts the goals scored by the home and away teams for this season up until last weekend and the whole of 2015-16. It affords us a good guide to what home advantage is worth in each division over a significant sample size of fixtures. In the top three divisions we see the percentage of goals scored by the home side is remarkably similar at around 56 per cent. League Two is the outlier, with under 52 per cent of goals being scored by the home team. It’s a large enough sample for us to accept home advantage appears to be a little lower than in the other three divisions and may be a trend which continues. Why? A combination of some of the factors mentioned above may well make sense, but I don’t think anyone has an all-encompassing explanation. Unfortunately, if we’re aware of this it’s quite likely the market will be too. So while there won’t be a path to riches by blanket backing away teams in League Two, it is certainly worth factoring into your thinking when having a bet. If a home side in League Two looks a slightly bigger price than you were expecting, then maybe this information could deter you from having a bad bet – and avoiding one bad bet is just as valuable as having one good one. So the next time that chap at the end of the bar suggests Home Park, Kenilworth Road or Fratton Park are difficult places to go, probably just nod along. I find it’s easier. For the past two weeks in this segment I’ve talked about teams who may be about to improve, which rarely offends anybody. It’s when you mention one who may be about to slide down the table you can sometimes annoy an army of loyal supporters. Regardless, here goes. Generally, the match odds in major leagues at kick-off time are a good reflection of the relative chance of both teams. Like a stock market, prices can fluctuate through the day. But the prices at kick-off, where demand meets supply and the sharpest brains in betting have all had their say, are infrequently far wrong. 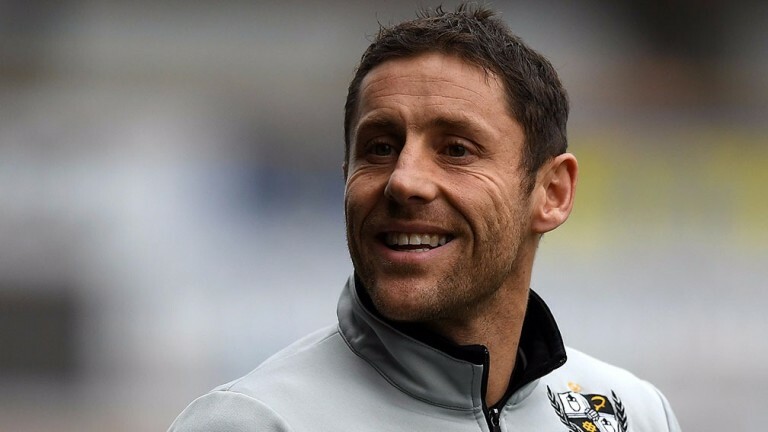 Last Friday, Michael Brown’s Port Vale hosted Bury in a League One match. That’s Bury, currently sitting in the relegation zone. At kick-off on the major betting exchange Port Vale, well above Bury in mid-table, were underdogs. After factoring in home advantage, which we know is real, Bury were still seen as more likely to win the game than Port Vale. That says a lot about Port Vale at the moment. If they can’t be sent off as favourites at home to Bury, how many more times this season can they realistically expect to start a match as favourites? I’d suggest extremely few. Vale are about to embark on a particularly tough run of fixtures. Seven of their next eight games are against teams in the top ten of the league. One thing’s for sure – they won’t be favourites for a single one. That doesn’t mean they won’t win any of them of course, underdogs can and do win all around the world every week. What we can say is come the end of that eight-match run the gap between them and the drop zone – six points at the moment – is more likely to be smaller than it is bigger. And with that in mind, backing them to be relegated should have some value.